The Guitar Pee urinal is an invention from AlmapBBDO, an advertising agency in Brazil. 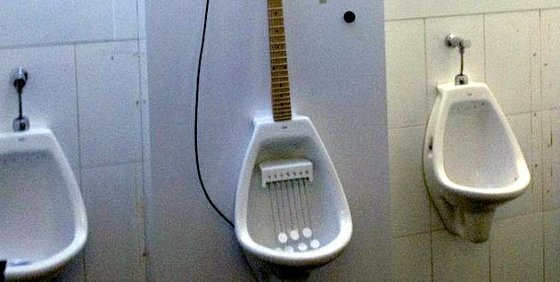 The special guitar-shaped urinal was developed for Billboard Music Brasil, and features special “strings” that play notes when you pee on them. Oh, you didn’t know that you can make music with your pee? Well, if you find yourself in a São Paolo bar, then you can. When you’re done emptying out all that alcohol you drank, make sure you flush the guitar pee urinal. Doing so will allow your “masterpiece” to be saved to an “M-Pee-3” file (that’s what they call it). Be sure to write the unique digital number down so you can go to their website later and retrieve your song using your mobile device. No word yet on when the ladies will be able to make their own music as well.